After taking longer than expected our studio is back online, time for more beats! Expect some new material this summer. Updates to follow. Yes it’s been a while since news updates, but we’re still alive. Uprise has made a major renovation at our studio hence the delays on new material and releases. We should be up and running soon with some new works. Stay tuned. Unreleased Resource track titled “Das Beat” now available. Happy holidays to all! From the staff at Uprise Records. Global Armaments’ Massive Beats Technology® trademark is now officially registered. Contact ep release “Contact” now available on iTunes, Rhapsody, and Sony Connect! After some down time in the summer, Uprise begins on some new material from Contact and Aggressor. Stay tuned for more updates. To go directly to the Navitas release on Rhapsody click here! Global Armaments’ Navitas release is now in iTunes stores, Rhapsody, and Sony Connect! Stay tuned for an update on Global Armaments’ Navitas release in the iTunes stores. Happy new year to all our supporters! Stay tuned as some new tracks are coming soon from the Uprise roster. Global Armaments prepares for their next album launch “Aftermath” scheduled for Q4 2006. Global Armaments releases it’s latest tracks titled “Seeker Reborn”. New tracks from Contact are in the works. Stay tuned for more info and uploads! Advance 44 has completed a podcast off of their releases. Resource has completed a podcast of their “EP1” release. Contact would like to thank everyone for a great show and a great night at Empire! Some images will be up soon, come back shortly to have a look. Global Armaments has completed a podcast of the “Navitas” release. Contact will be performing live at Empire in Toronto, June 10th 2006. Hope to see you all there. Uprise Records will soon have music available through the iTunes store. Details to follow soon. Uprise records has begun production on a podcast which will feature more music from our roster. Stay tuned for a release date! Uprise Records begins a major update to the website. 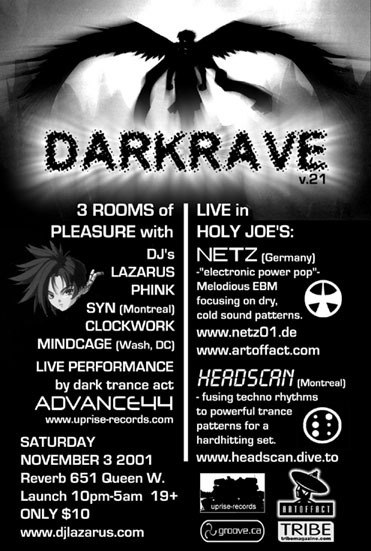 Advance 44 threw down a killer set at Darkrave. Thanks to everyone who was there and for those who weren’t, our beats will come for you! Stay tuned for some upcoming single releases that will be available for download here on the uprise records artist pages. WARNING: Kleansor by Advance 44 will be released soon to ensure your aural destruction. Advance 44 threw down a killer set, thanks to everyone who was there! 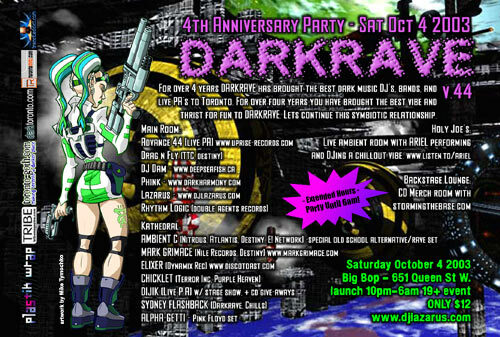 Advance 44 makes their first appearance at Darkrave. Much thanks to all that were there!